Whew, now that that’s over (winter), it’s time to get out and about in town, eh?! Hit the streets, hit the trails, and hit the shovel (hard) as you stash it away for good this season. 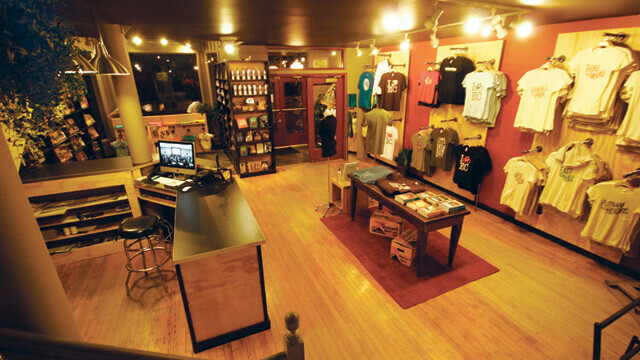 You may recall we opened a little spot called The Local Store back around the holidays. While it hibernated a bit over the winter months (as many shops do), it’s definitely sprung this spring. A slew of new products have rolled out over the last few weeks and a few more are slated to arrive soon. Most notably we’ve created four new local t-shirts that people seem to enjoy, all inspired by the history and culture of our community. There’s a Walters Beer shirt, an Eau Claire Bears Baseball shirt, a Wisconsin State Flag shirt, and a Rocket Slide shirt based on the beloved playground icon that used to be in Carson Park. And we’ve put a bunch of effort into some new screen-printed local posters that will be available very soon as well. We’ve even revived a stack of prints with an amazingly detailed drawing of tons of Eau Claire features circa 1995 – it’s pretty cool. So what I’m saying is, now that it’s nice outside (most of the time), get out of the house and stop by the Local Store at 17 S. Barstow. It’s almost guaranteed that we’ll have something new to show you each week over the next couple months!